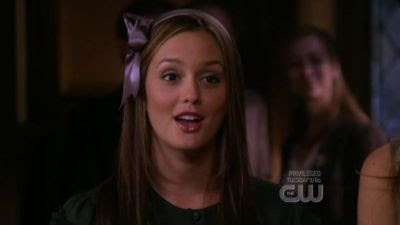 The Monogram Swap is a website that allows shoppers to list gently used monogrammed items for sale. Until December 1st you can list your items for FREE!! The best part is you set the price for your item! If it sells you keep all the money (minus a tiny 10% transaction fee). 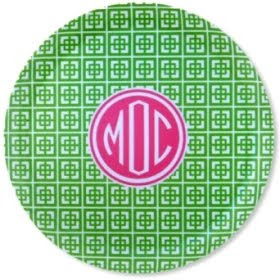 As The Monogram Swap was launched earlier this month, there isn't a ton of inventory on the site, but hopefully as the word spreads, the site will fill with more and more monogrammed items! So rack your brain and your closet and see if you have anything to put on the site or have anyone you can recommend it to. Sent in by Natalie at Carolina Prep. Natalie writes, "University of South Carolina's homecoming theme this year was 'Anchor's Away.' I knew we were in for some cute tshirts! 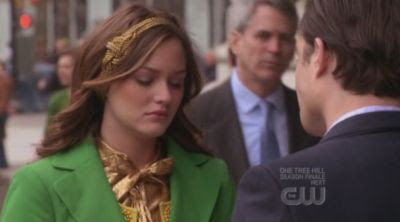 As soon as I saw my sorority's tee I immediately thought of you!!" 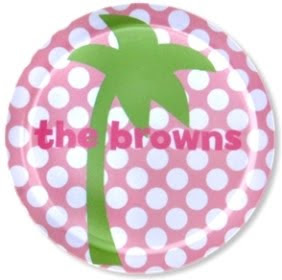 Thanks to Preppy Beach Chic Girl I bought these monogrammed earrings. As you have read before, I host a weekly TV night at my house on Mondays. This is what N wore last week. 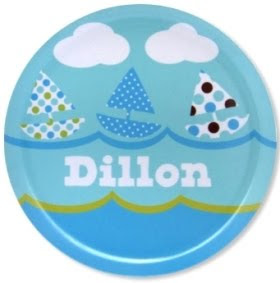 If you would like to share a nautical outfit you (or your friend, spouse, child, sorority, etc) have please email me as I would love to do a weekly nautical outfit post! My email is listed on my profile. 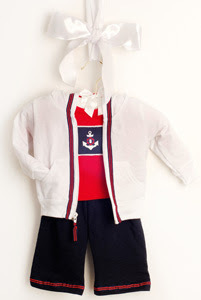 Set includes: White Striped Hooded Jacket, Navy Striped Pant, Navy Anchor Hat, Red Long sleeve or Short sleeve One Piece, and Bib. Almost 400 people came to our neighborhood block party! This year was a western theme and it was really fun. 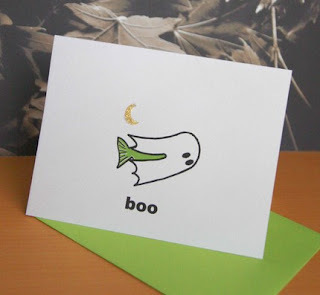 We had a bunch of activities for the kids (pony rides, pumpkin decorating, line dancing and more) and it was catered by a local restaurant I love. I am so lucky that my neighborhood is so close and everyone makes an effort to know their neighbors. Before the crowds started showing up! The moonbounces (apparently now they are called bouncies?). An hour later they were filled with jumping kids! The last two weeks have been crazy busy! So much to update you all on! 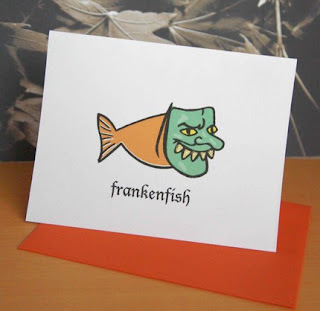 First, thank you for the birthday wishes, cards, and presents. My everyday wallet is huge (and heavy) so I am excited to have a night time/going out wallet that will hold just the basics! I also got red Kate Spade tights to keep me warm under my fall and winter skirts/dresses. Vineyard Vines pink polo that says Martha's Vineyard on the sleeve. She got it for me when she was there over Labor Day. From N and D (and really M too): BUMPITS! I haven't worn them out yet but I can't wait to see how they look! 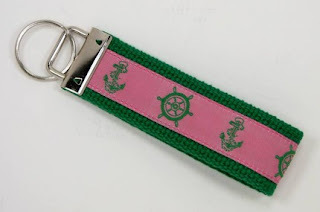 Pink and green anchor keyfob! Anchor notecards from Crane & Co and Lilly Pulitzer Wink Perfume! 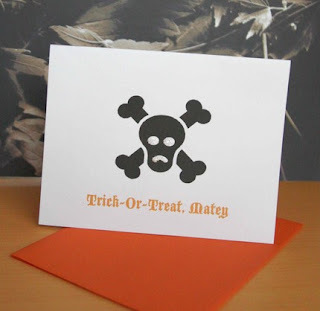 Head on over to Muffy Martini's blog to read my guest post on nautical honeymoons! 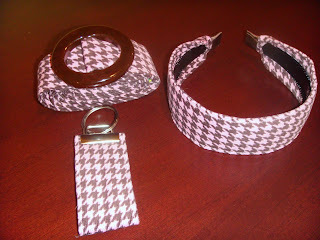 Winner of giveaway 1 (houndstooth set from Three Chickadees): JULES from Chic n Pink! 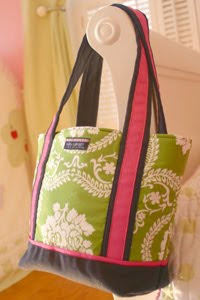 Winner of giveaway 2 (lighthouse tote from Preppy Princess): CAROLINE from Antique Rose! 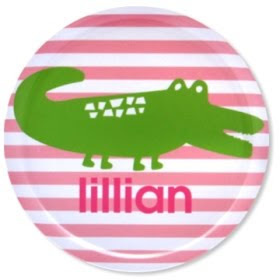 Winner of giveaway 3 (Lilly candle): KATIE C from Southern Seersucker! 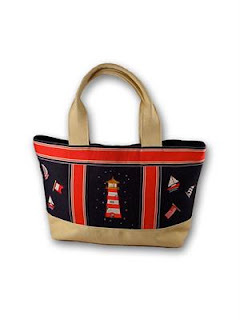 Winner of giveaway 4 (Anchor tote): SeaLaura! WINNERS PLEASE EMAIL ME at the email listed on my profile to claim your prize! 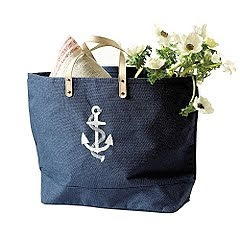 Anchor tote from Ballard Designs. Keep summer alive! 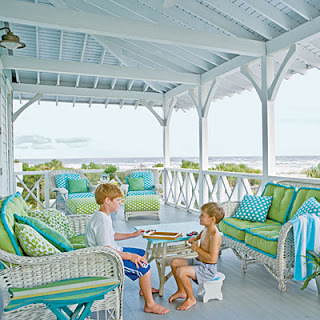 "Escape to the beach no matter the season and remind yourself of a time of fun and relaxation. The fragrance opens with notes of sliced watermelon, sunny citrus and marine accord. The heart enchants with jasmine blossom, tiare flower and lush frangipani. 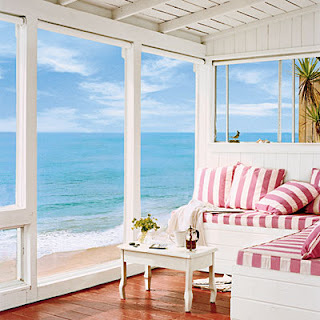 The sun sets on the fragrance with base notes of salt crystals, golden amber and sweet vanilla." 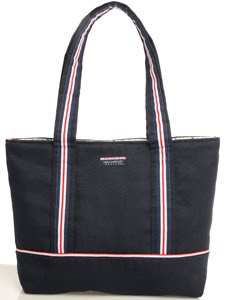 You'll fall in love with this great canvas tote from the Preppy Princess! 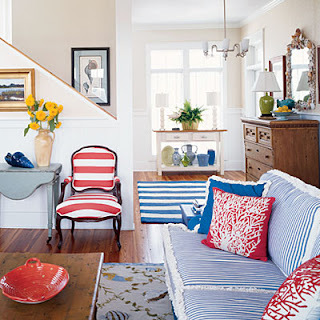 It's a rich navy and sand with an embroidered lighthouse and other nautical images as decorative touches. 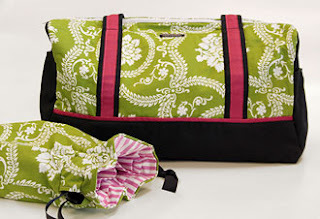 It features a zippered top closure and inner pocket. The winner will receive a headband, belt (available in size s-xl), and keyfob in the cutest pink and brown houndstooth pattern thanks to Lisa at Three Chickadees.